MANILA, Philippines -- Glowing-red lava spurted in a fountain and flowed down the Philippines' most active volcano on Tuesday in a stunning display of its fury that has sent more than 21,000 villagers fleeing to safety and prompted police to set up checkpoints to stop tourists from getting too close. Officials strongly advised people not to venture into a danger zone about 3.7 to 4.3 miles around Mayon, including residents who want to check their homes, farms and animals, and tourists seeking a closer view. "They say it's beauty juxtaposed with danger," Office of Civil Defense regional director Claudio Yucot said. 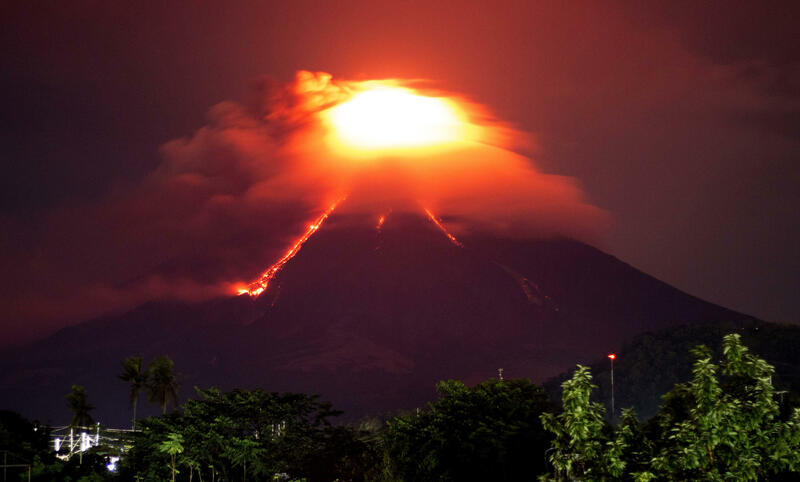 At least 21,800 people have been displaced by Mayon's eruption since the weekend, including more than 16,800 villagers who took shelter in 22 schools, Yucot said by telephone. Others took refuge in the homes of relatives. "We have witnessed lava fountaining yesterday, that's why we have additional families who evacuated due to the threat," said Romina Marasigan, spokeswoman of the government's main disaster-response agency. Scientists have not yet detected enough volcanic earthquakes of the type that would prompt them to raise the alert level to four on a scale of five, which would indicate an explosive eruption may be imminent, Solidum said. Emergency response officials previously said they may have to undertake forced evacuations if the alert is raised to four. In a bid to discourage villagers who insist on returning to the danger zones to check on their farm animals, officials planned to set up evacuation areas for animals, including water buffaloes, cows, pigs and poultry, Yucot said. Temporary school sites were also being considered to ease the disruption to education after school buildings were turned into emergency shelters, he said. Mayon is in coconut-growing Albay province, about 210 miles southeast of Manila. With its near-perfect cone, it is popular with climbers and tourists but has erupted about 50 times in the last 500 years, sometimes violently. In 2013, an ash eruption killed five climbers who had ventured near the summit despite warnings. Mayon's first recorded eruption was in 1616 and the most destructive, in 1814, killed 1,200 people and buried the town of Cagsawa in volcanic mud. The Philippines lies in the so-called "Ring of Fire," a line of seismic faults surrounding the Pacific Ocean where earthquakes and volcanic activity are common.